Get ready to 'rock the house' with this smash hit from the group Chumbawamba! Already the number one song in the U.K., it's the ultimate rugby/soccer/sports anthem. 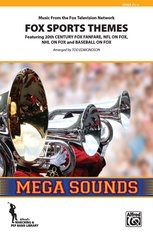 Many stadiums throughout the U.S. have already caught on to this inspirational number, and we have the definitive (and exclusive) arrangement for marching/pep band by Tod Edmondson. The lyrics say it all: 'I get knocked down, but I get up again, and you're never gonna keep me down.' Bound to motivate any team, TUBTHUMPING is the sports song of the decade!